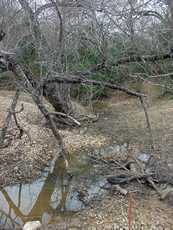 Lost Graves of Jeddo Texas, and Occurance at Peach Creek Bridge. In Jeddo are ten lost graves located in a pasture on 713 E. directly across from Peach Creek Dr. As far as I know, these graves are unknown to the public. This is a bother to me. My purpose in writing is to let someone know about this cemetery. [There are only] three other people who know these graves exist. 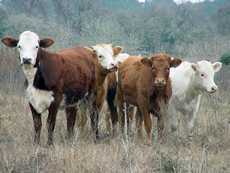 Only one grave still has a tombstone and it has been knocked down by the cows. 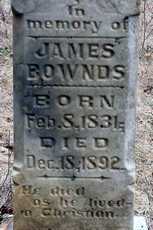 It is the grave of James Bownds (pronounced Bounds) who was killed by Richard Whitehead at the Peach Creek bridge on Peach Creek Dr.
Richard Whitehead stood trial for the murder of James Bownds. He was acquitted. 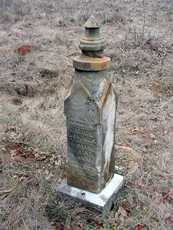 Richard Whitehead was killed in Rosanky on Sept. 29,1897 by Philip Davis. Philip Davis stood trial for the murder of Richard Whitehead. He was acquitted. Both men had large land grants in Jeddo but each lost land defending himself. There was bad blood between James Bownds and Henry Lundy. Whitehead, Henry Lundy and a Mr. Coquet were en route to Rosanky on horseback when they met James Bownds at the Peach Creek bridge coming from the opposite direction. Coquet made haste to get in the trees, Whitehead got off his horse on the opposite side from Bownds with the horse between him and Bownds. Brownds shot at Whitehead and missed but he shot the saddle horn off of the saddle. Whitehead shot, did not miss. I have never checked the court records but I rather think Whitehead was acquitted on self defense. I find it a mystery that Bownds shot at Whitehead instead of Henry Lundy. Maybe Lundy went into the trees. The original bridge which was built by Jeddo residents (white and black) was used until the flood of 2000 washed it away. (I believe it was 2000 when several such bridges in Bastrop County were destroyed by a flood). It is now a modern bridge easy to drive over without noticing the creek The original one was a one-way wooden bridge. By the way, Jeddo is part of an area that was originally Hallmark Prairie. Editor's note: Velma Fogle is from the corner of Texas where the three counties of Bastrop, Caldwell and Fayette come together. Her knowledge of the area is deep and she has written a history of the St. Phillip's Colony of Bastrop County.